HOUSTON, Texas -- At least 2,000 people have been rescued over the weekend in flood-ravaged Houston, with 290 of those rescues coming since midnight, according to city officials. 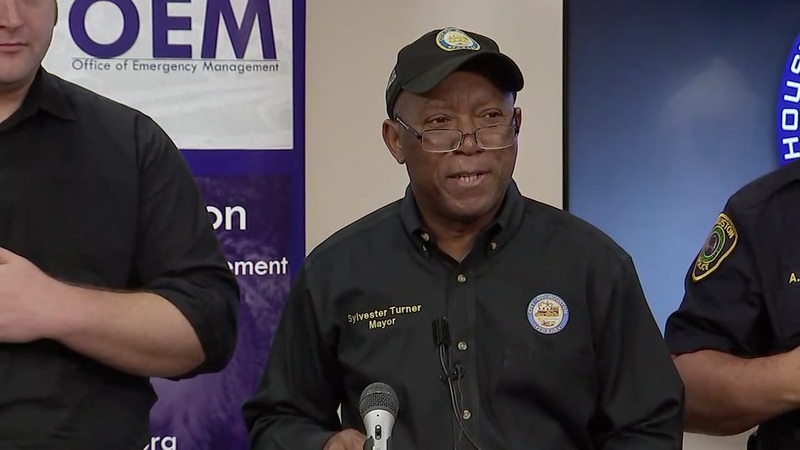 Mayor Sylvester Turner vowed during an update of emergency management in the city that completion of 185 remaining critical rescue calls is priority number one. Officials addressed the stagnant calls through the 911 system, urging folks to stay on the line as opposed to hanging up when there is no answer. Houston Emergency Center said dispatchers have received more than 75,000 calls through the system. The good news, officials say, is the number of pending calls have gone down from hundreds to just 10. In addition, Houston Fire Department Chief Samuel Pena said more than 5,500 calls for service were logged in the last 24 hours, with 4,000 of those calls being water-related. The fire department has 350 more personnel from the state and federal level out to help with the same number of workers expected to be added on Tuesday. Houston Police Department Chief Art Acevedo added personnel have been able to do nighttime rescue missions due to visibility. Acevedo also warned people about taking advantage of the vulnerable city through looting. According to Acevedo, four people have been arrested so far. He also claims folks move in from other parts of the country with the sole reason to loot. He said more officers are coming from around to state to support HPD. HPD Chief Art Acevedo told GMA they will rescue every person who has called by the end of the day. Officials also addressed abandoned cars all over the city, observing whether those vehicles were towed. Acevedo pointed folks to findmytowedcar.com or an HPD hotline at 712-308-8580. He advised, though, not to go around the city yet to find towed vehicles. Turner gave credit to mayors from around the country who have given material support to the region. He mentioned Boston Mayor Marty Walsh for sending high-water rescue personnel and equipment as well as clothing to those in shelters. He said 5,500 people are expected in shelters with that number expected to increase by the end of the day, citing Red Cross. Finally, Turner addressed the area dams and the operations for controlled release. The releases at overflown dams at Barker and Addicks will add water to Buffalo Bayou, cautioning additional flooding in the works. He also remarked on the Northeast Water Purification Plant becoming completely submerged. Pumps are being sent to alleviate the water. RELATED: Reservoirs rising even after release of floodwater in west Harris Co.
Why were city vehicles left underground during Harvey?